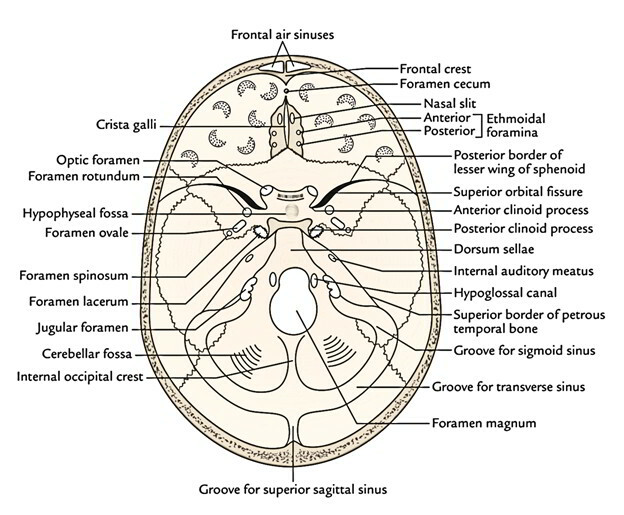 The floor of the middle cranial fossa being composed of a small median part and an enlarged lateral part on every side, resembles a butterfly. The limbus sphenoidalis in the median region. The limbus is an anterior border of shallow transverse area termed sulcus chiasmaticus. The dorsum sellae (a rectangular plate of bone) in the median region. The median part of the fossa is composed by the body of the sphenoid, which is more or less cuboidal. Sulcus chiasmaticus, leading on every side into the optic canal which leads into the orbit. Sella turcica (Turkish saddle). The lateral ends of the tuberculum sellae bear the middle clinoid processes and the lateral ends of the dorsum sellae bear the posterior clinoid processes. It’s the hollowed out upper surface of the body of the sphenoid (hypophyseal fossa) bounded in front by the tuberculum sellae, the posterior border of sulcus chiasmaticus and behind by the dorsum sellae. The sella turcica is composed of 3 parts: the tuberculum sellae, the hypophyseal fossa and the dorsum sellae. The hypophyseal fossa is inhabited by the pituitary gland in life. The carotid groove is a shallow sulcus on each side of the body of the sphenoid lateral to the hypophyseal fossa. It starts at the foramen lacerum, runs upward, then forward and ultimately upward again to finish at the medial to the anterior clinoid process. The passage of internal carotid artery takes up this groove. Occasionally the middle and anterior clinoid processes are blended by a bony bar creating caroticoclinoid foramen for the passage of internal carotid artery. The median part (region) of the middle cranial fossa is likened to a bed with 4 clinoid processes representing the 4 bed posts (Gr. Kline = a bed). The lateral part of the middle cranial fossa on every side is composed by the upper surface of the higher wing of the sphenoid along with the anterior surface of the petrous temporal bone and the squamous part of the temporal bone. It lodges the temporal lobe of the cerebral hemisphere. It’s limited in front by sharp posterior border of the lesser wing of the sphenoid and behind by sharp upper border of the petrous temporal bone. These bony ridges are associated with the sphenoparietal and superior petrosal sinuses respectively. Foramen spinosum is posteriormost and situated at the posterior tip of the higher wing. It’s so called because on the undersurface of the higher wing at this point is the spine of sphenoid. Foramen ovale lies just in front and medial to the foramen spinosum. The reason behind its name is clear. Foramen rotundum is in front and medial to the foramen ovale. It leads downward and forwards into the pterygopalatine fossa. 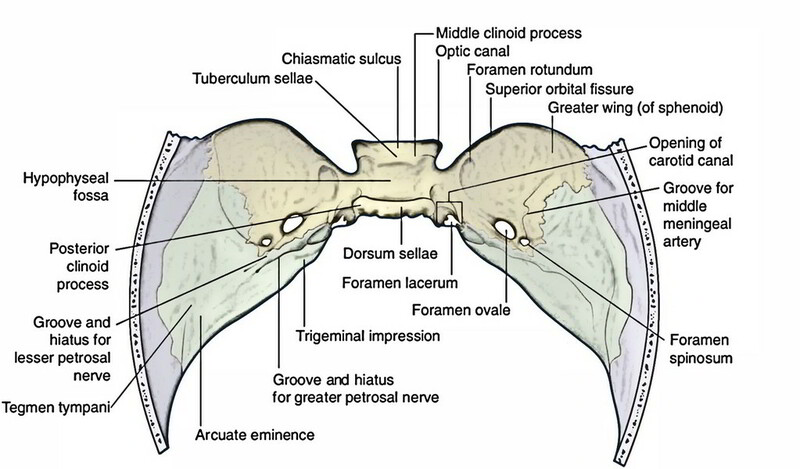 Superior orbital fissure (an elongated triangular fissure) is infront and lateral to foramen rotundum under the overhanging ledge of the lesser wing of the sphenoid. It’s truly found between the body, smaller wing and greater wing of the sphenoid. Of these 4 openings, nevertheless, only the very first 2 can be viewed on the inferior outermost layer of the base of the skull. Along with the 4 foramina, occasionally 2 moreforamina are within the greater wing of the sphenoid. Emissary sphenoidal foramen (of Vesalius): It is located medial to foramen ovale and carries an emissary vein from the cavernous sinus. Canaliculus innominatus: It’s situated on a bar of bone between the foramen ovale and foramen spinosum. It carries the lesser petrosal never when the latter doesn’t go through foramen ovale. B). Groove for middle meningeal vessels leads forwards from the foramen spinosum: After a brief space, the groove divides into the anterior and posterior grooves, which lodge the anterior and posterior branches of middle meningeal vessels. The anterior groove continues to the pterion and after that arches upward and backwards across the parietal bone. At the pterion, the groove could be transformed into a bonyburrow, therefore raising the chance of ripping the middle meningeal vessels in trauma on the side of the skull in the pterion region. The posterior groove enters backwards across the squamous part of the temporal bone. 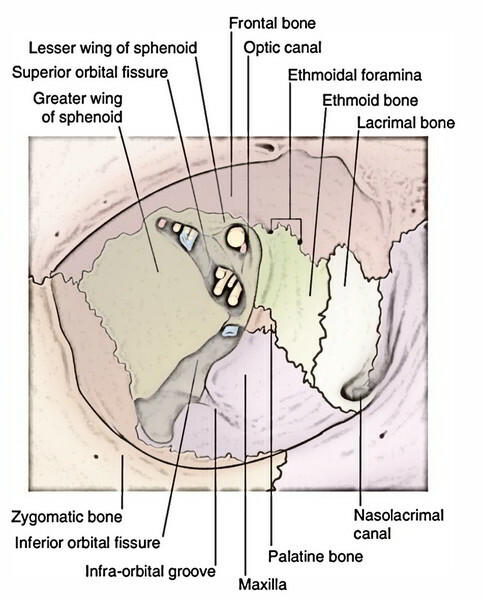 3) Foramen lacerum is located at the posterior end of the carotid groove on the side of the body of the sphenoid, posteromedial to the foramen ovale. It’s really a gap between the petrous temporal and sphenoid bones. Trigeminal impression, a shallow depression medially near the apex of the bone. The trigeminal ganglion is located on this particular depression. Hiatus and groove for the greater petrosal nerve: In front of arcuate eminence, a slit or hiatus for the greater petrosal nerve is continued as a groove to the foramen lacerum. Hiatus and groove for the lesser petrosal nerve lielateral to hiatus and groove for the greater petrosal nerve and result in the foramen ovale or canaliculus innominatus, if present. Arcuate eminence (a rounded elevation) created by the underlying superior semicircular canal can be found at the middle of the anterior surface of the petrous temporal bone. Tegmen tympani, a thin plate of bone anterolateral to the arcuate eminence. It creates the roof of middle ear (tympanic cavity). Its anterior part turns downward into the squamotympanic fissure. The inner surface of the squamous part of the temporal bone is grooved by the middle meningeal artery and its terminal anterior and posterior branches. Optic nerve: together with its sheath of meninges, i.e., dura mater, arachnoid mater and pia mater. Ophthalmic artery: a branch of cerebral part of the internal carotid artery. Sympathetic plexus around the ophthalmic artery. This fissure is split into 3 parts by means of the common tendinous ring of Zinn. Superior and inferior sections of the oculomotor (3rd cranial) nerve. Nasociliary nerve: It is located between the 2 sections of the oculomotor nerve. Abducent (6th cranial) nerve: It is located lateral to the nasociliary nerve. Sympathetic root of the ciliary ganglion: It is located between the nasociliary nerve and the lower sections of the oculomotor nerve. Recurrent meningeal branch of lacrimal artery. 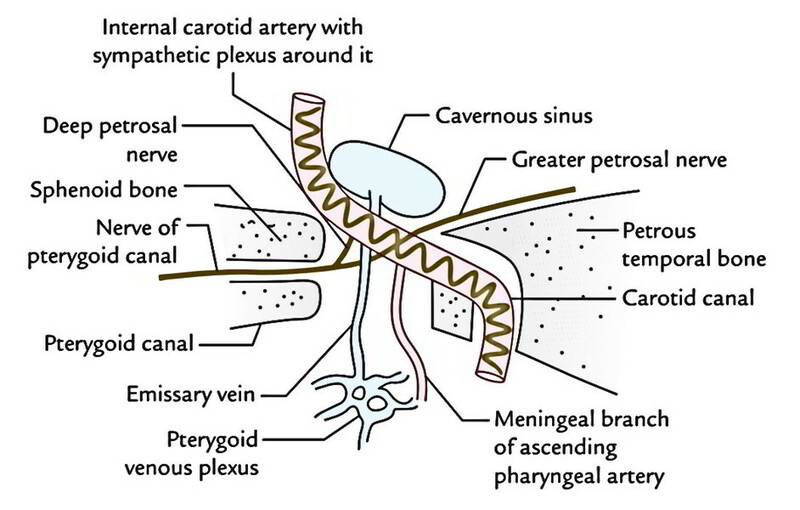 Emissary vein: linking the pterygoid venous plexus to the cavernous sinus. Emissary vein: from the cavernous sinus to the pharyngeal venous plexus. Internal carotid artery together with the sympathetic plexus around it enters it from behind and exists above. Greater petrosal nerve enters from posterolateral aspect and leaves anteriorly as a nerve of pterygoid canal. Internal carotid artery and greater petrosal nerve don’t go through and via foramen lacerum. The greater petrosal nerve joins the deep petrosal nerve originated from the sympathetic plexus around the internal carotid artery to create the nerve of the pterygoid canal (Vidian’s nerve) which goes through the pterygoid canal. 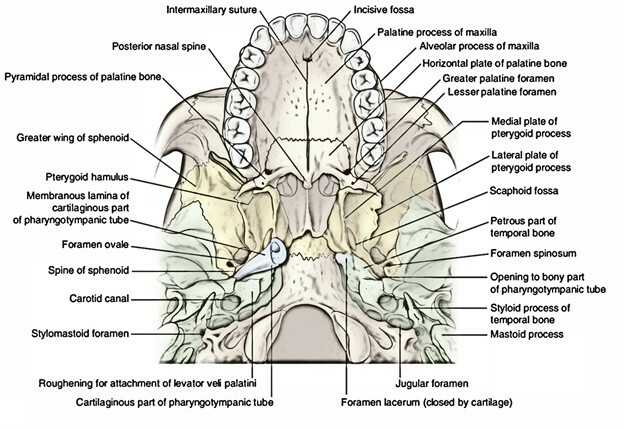 The posterior orifice of the pterygoid canal is located in the lower part of the anterior wall of the foramen lacerum. Fracture of middle cranial fossa: The middle cranial fossa is the commonest site of fracture of the base of the skull. It’s partially due to its position but also because it’s weakened by numerous foramina and ducts. In fracture of the middle cranial fossa, the tegmen tympani are normally fractured and the tympanic membrane is torn. Because of this, there’s bleeding from the external acoustic meatus and a leakage of cerebrospinal fluid (named cerebrospinal otorrhea). The facial and vestibular cochlear nerves might be dam-aged. Bleeding may happen via nose and mouth if the body of the sphenoid is fractured. Vertigo may take place if semi-circular ducts are included.